1.The Soldering iron kit can meet all your soldering work needs with all fitting included,thermostat soldering iron,digital multimeter,desoldering pump,tweezers,tin wire,soldering stand,iron tip,pliers,mini wire stripper,making your soldering more easy and comfortable. 2.It have a carry bag,then it is rather convenient to store small tools and easy to carry. Soldering Iron Kit design for various uses,from home DIY,electrical repairs jobs and other soldering project. 1.A temperature controlling knob on the soldering iron: There is a spin knob on the soldering iron which is safe and convenient for you to control the heating temperature. And the insulating silicon gel prevents the iron from dropping effectively.60W 220V soldering iron adopts inner-heated ceramic heater technology which makes heat up to 200-450° within 2 minutes. 3. Multimeter accurately measures current, voltage, resistance, and so on.The LCD screen shows you the data clearly.Displays results quickly with 2-3 readings per second update speed. 4.Precision Screwdriver Set:Wonderful Compact Size and very Handy Combination 5-In-1 Precision Pocket Screwdriver.Includes Drivers Bits for Different Purpose.Engraved Pattern Promises Comfortable Touch and Labor-saving Performance. 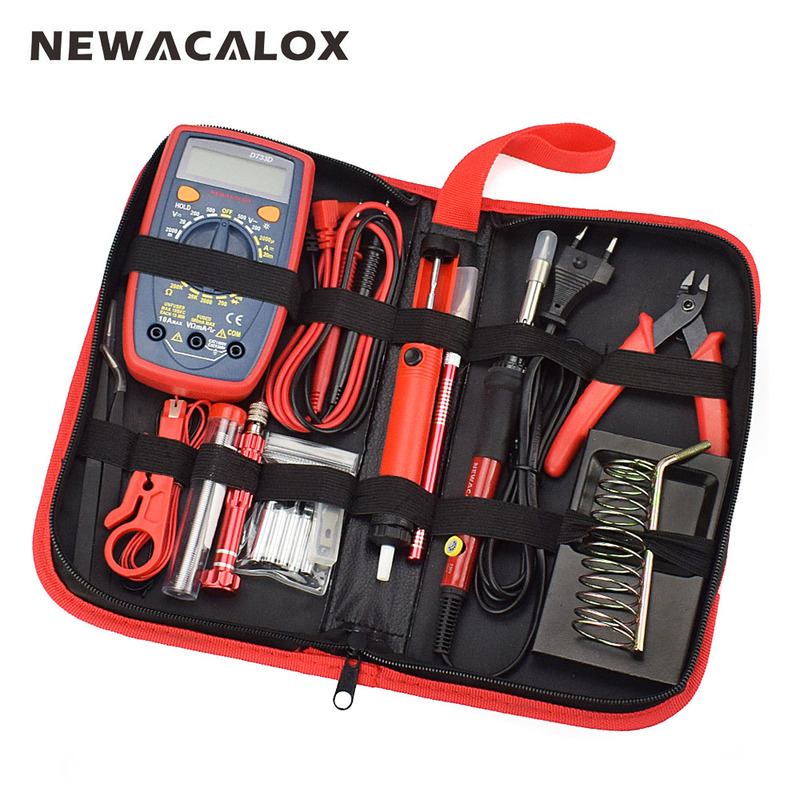 5.PU Toolbag Protable Storage:The Full Set Comes With a Durable and High-end Leather Toolbag,Which Is Rather Convenient to Store Small Tools and Easy to Carry Anywhere for Electric Repair, Home DIY And Other Soldering Projects. This Can Also Help Avoid Losing The Soldering Gun And Other Accessories.